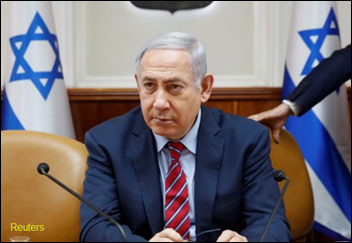 Israel will spend $287 million to make the health data of its 9 million citizens available to researchers and private companies for work on preventive medicine and personalized medicine projects, Prime Minister Benjamin Netanyahu announced Sunday. Most citizens of Israel belong to HMOs, whose EHRs will provide the electronic patient data to the government unless they opt out. Concerns have already been expressed about patient confidentiality and whether the billions of dollars Israel could charge drug companies for using the data will trigger higher drug prices. From Imaginary Lover: “Re: Dr. Jayne’s comments about SteadyMD’s CEO declining to comment on its SEC-reported funding. It’s unusual, but understandable. Funding comes at a cost that includes loss of control and dilution (sometimes massive) of previous shareholders. The co-founder and CEO who declined to comment was probably a major shareholder before this infusion, but maybe not afterwards. New funding may save a company from certain death (bankruptcy) but can be the beginning of another kind of sickness – now the company has to pull a rabbit out of the hat for the new investors in short order to give them a return. If it can’t, investors may pull the plug or fire the CEO. The fellow who invested his time, sweat, money, and lifeblood is taking on risk and losing equity, all in one fell swoop. Trying to act like the belle of the ball in those circumstances must be a challenge. I feel for the guy.” I enjoyed the wit, warmth, and insight of this comment so much that I’ve asked the author to consider making further contributions. Sometimes you just read something that elicits a “I want to hear more from you” response. Not only do we have much work to do in delivering a “comprehensive health record,” we can’t even agree on how far along we are. Reader comments note health system data hoarding, the lack of semantic standards needed to make exchanged data useful, and health systems that don’t fully populate what could be a complete medical record. New poll to your right or here: what online sources have you used in choosing a doctor? I always pair up my insurer’s director with Healthgrades and haven’t used any of the other sources I listed. Responses to “What I Wish I’d Known Before … Being Admitted to a Hospital or Being Seen in the ED” suggest that while hospitals provide many of us with our living, our experience as patients in them is frustrating and sometimes dangerous. One bizarre example: a hospital insisted on giving a newly-admitted patient the meal that the room’s since-discharged previous occupant had ordered (a fruit cup), so the famished poll respondent ordered a nice dinner on discharge day so the next patient wouldn’t starve. Let’s hear from folks who have retired or downsized their careers – what do you wish you’d known? Regulators approve the merger of Advocate Health Care and Aurora Health Care that will create the country’s 10th-largest non-profit health system upon closing next week. Advocate Aurora Health will have 27 hospitals, 3,300 employed physicians, 70,000 employees, and annual revenue of $11 billion. The organizations predict that synergy will support the always-promised, never-delivered goal of higher quality and lower cost. Wolters Kluwer completes its acquisition of 16-employee medical student learning platform vendor Firecracker. 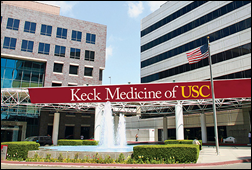 USC’s Keck School of Medicine joins the global health research network of TriNetX. MultiCare Deaconess Hospital (WA) will go live with Epic in summer 2018. The analytics-powered insurer that is being created in a joint venture between Sutter Health and Aetna hires Steve Wigginton (Valence Health) as CEO. Evolent Health acquired Valence Health for $219 million in October 2016, after which it replaced Valence’s CEO Andy Eckert with Wigginton, then Evolent’s chief development officer. Culbert Healthcare Solutions hires Wayne Thompson (Mount Nittany Health) as executive consultant. 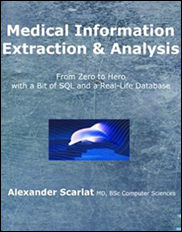 Alex Scarlat, MD publishes “Medical Information Extraction & Analysis: From Zero to Hero with a Bit of SQL and a Real-life Database.” It gives clinicians an introduction to SQL using hands-on exercises running against a de-identified ICU patient database from BIDMC. It also helps IT folks understand the data elements that interest clinicians. 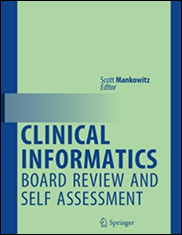 I also noticed when looking up Alex’s book on Amazon that Springer has published a review and self-assessment for the ABPM’s clinical informatics board exam. I can’t vouch for the ultimate outcome of improving test scores in return for your $125, but the material looks solid, the writing is meaty, and the sample test looks darned hard. The other available review book ($129) has just three Amazon reviews, but one titled “Not fit for sale” raises a red flag in noting that “clinical” is misspelled on the book’s spine. In Canada, New Brunswick offers a $2,500 bonus to doctors who start using its provincial EHR, hoping to entice the 400 of its 750 physicians who haven’t transitioned off paper charts to do so. The EHR was implemented in 2012. 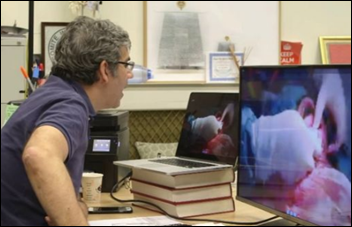 A surgeon in England believes that the Syrian military hacked his laptop to determine which hospital he was helping with video surgery consultations as featured on a BBC program, after which suspected warplanes destroyed the hospital with a bunker-busting bomb. A security expert suggests creating a VPN connection for secure laptops, but the surgeon has since stopped offering video help to doctors in war-torn areas. Harvard Business Review describes Mayo Clinic’s effort to reduce ICU clinician overload caused by a never-ending stream of data. They’re using “ambient intelligence” in applying NASA methods to identify clinicians whose workload requires them to filter vital information from data clutter, identifying the 60 data elements that are important for taking quick action. 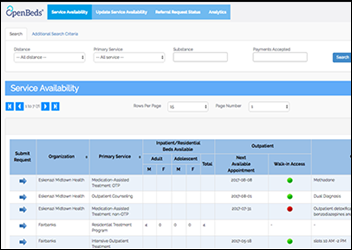 The end result was an EHR-connected, rules-based, color-coded dashboard that saves an ICU clinician an hour each day while improving outcomes and reducing costs. Mayo has licensed the technology to Ambient Clinical Analytics. 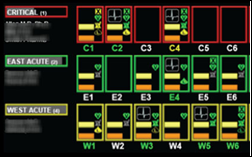 An addiction publication profiles OpenBeds, software developed by Johns Hopkins medical school faculty member Nishi Rawat, MD. Indianapolis social workers are using it to find available space in opioid addiction treatment facilities. In China, a media company tells a woman applying for a live-streaming job that her appearance is “far from that of an Internet celebrity,” advising her to have cosmetic facial surgery at their expense. An employee went to the hospital with her on the day of surgery and told her she would need to borrow the $6,300 cost from an online loan company and would be reimbursed afterward. She wasn’t, and she was let go because she still didn’t meet appearance standards. She is suing the company. Such financing is called a “face loan” in China, where would-be Internet stars with poor credit histories often find themselves unable to pay the money back. Vince and Elise pored over health IT vendor financial filings to name their Top 10 hospital system vendors by annual revenue. Most are unsurprising and the Top 3 hold a giant chunk of the total, but let’s hear it for those #7-10 companies that get less attention as significant players – Harris Healthcare, Medhost, and Cantata Health. Vince notes that Meditech is back in growth mode after four years of declining revenue and also observes that none of today’s top five vendors were on his 1998 version of the list at all. It’s pretty interesting that it took just 20 years for acquisitions (some of them ill-advised and three involving Allscripts buying its way into today’s Top 5) to decimate all of the 1998 Top 10 other than Meditech and CPSI. QuadraMed celebrates Health Information Professionals Week. API The Rapists? – I think that’s what Oracle’s calls Google developers.